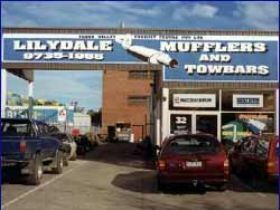 Yarra Valley Exhausts trading as Lilydale Mufflers and Towbars is located in Main Street Lilydale and has been trading from this location since 1983. It is owned and operated by David Blythe who has twenty five years plus experience in quoting, building and installing exhausts. Services offered include custom built extractors, standard exhausts supplied and fitted, muffler replacements and full custom exhausts built to customer specifications. All the major brands of exhaust components are available as well as full stainless steel systems for racing or street applications. 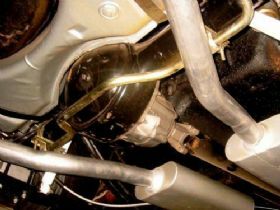 A wide variety of chrome and stainless tips are also stocked to complement your new exhaust system. The staff can also organise chroming or coatings for your new exhaust system. The workshop is spacious with four bays, each with their own hoist to allow a quick turnaround time on each job. There are three very experienced staff who collectively have over fifty five years experience in the industry so you can feel comfortable that the knowledge and experience of the team will result in the job you want. Hayman Reece towbars are also supplied and fitted to a wide range of vehicles including four wheel drives and modern cars and wagons. Over the years the team has worked on Rolls Royces through to Morris 1000s and everything in between accumulating priceless knowledge and experience in meeting customer expectations. The passion shared amongst the staff for what they do results in the job customers want. If you are looking for a new exhaust system for your classic, street machine or hot rod give David a call on (03) 9735 1955 to arrange a free inspection and quote.